The purpose of this post is to explain the custom html style file option. There are already many html options. Please explore those first before resorting to your own. This option is for advanced users only with good html and css knowledge and very specific requirements. 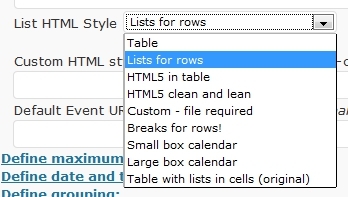 A number of html styles or structures in which to report events have already been defined for you. The box calendar styles have some very logic also attached to them. edit it very carefully, ensure you have balanced tags. be sure to choose the ‘custom’ option when you want it to take effect. Test thoroughly with a complete set of event data and of course VALIDATE the html. So really you’d have to have some pretty unusual requirements or be pretty perverse to reinvent the wheel and do your own html style file.